I think we can safely say that EVE was never meant to be a quality act. For a start, their name is a rather forced acronym of Ebony Vibe Everlasting. Plus, they were very obviously riding on En Vogue's coat tails and not doing it with very much class; their tracks were available as either anaemic R&B or remixed to destruction into cheesy piano house. It was not good. The good news? From this epic train wreck of monumentally cynical proportions came... a rather good remix! With the melody re-sung at house speed (something he often did with Mariah Carey), Morales made an excellent if near-cheesy house track that starts off with lashings of vaguely dodgy piano and then veers off halfway through into more interesting, even surprising dubby territory. There's a bit that starts at 7'29" that gives me goose pimples. How mad is that? Anyway, great stuff. The bad news? Morales' original mix of 11 minutes was inexplicably edited down - or rather hacked apart - to under 10 minutes for the CD-single release. The intro no longer had the right number of bars, didn't start on the right beat. The passage from vocal to dub had been reduced making it sound tacked on, unnatural. It's amazing what some hasty editing in the mastering studio can do to ruin the feel of a song. So I reconstructed it. Not a mammoth job, but it now sounds - to me - a lot more organic. Why they couldn't just leave the full version on the CD, I don't know. I can see the point of reducing a track from 10 minutes to 4 for single release or radio play, but 11 minutes to 9, and making a hash of it? Just stupid. 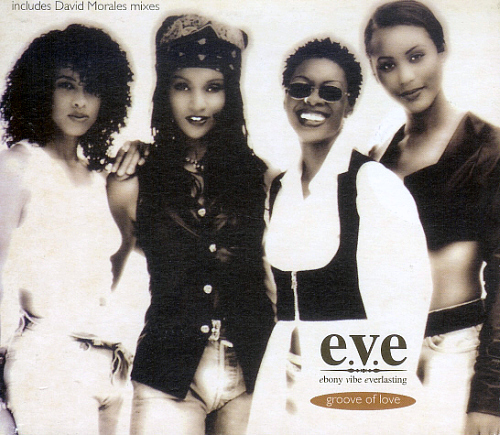 EVE released one more single after this one and disappeared, thankfully. If you can sing, why sing crap? They got what they deserved. Groove of Love by four women who made fools of themselves and didn't make any money, here (14MB). Thanks for the edit, outcome is superb!